Wireless and emerging mobile technologies are one of the most dynamic and fast-growing industries on the planet, and as a result they help us communicate, entertain, do business and banking, educate ourselves, and a whole host of other things on the move. Mobile technologies are rapidly making ways into Canadians’ lives and simplifying our mode of communications, thereby enhancing productivity in the overall economy. The widespread usage of mobile technologies in Canadian society, resulted in 26 million Canadians – out of a total of 35 million – own a mobile phone today. The stats on smartphone penetration and data growth, and the rapid spread of mobile broadband networks, are gradually bringing the promise of the Internet of Things. Mobile is omnipresent and rapidly influence nearly every sector in technology: cloud, big data, enterprise software, digital media, advertising, commerce, and payments. 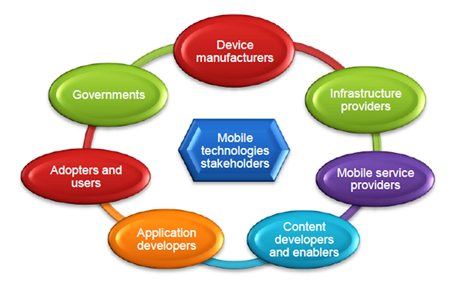 Mobile is a complex ecosystem, consisting of unique value chains, technologies, economics, and business models, that needs certain standardization for better and faster applicability in almost all sectors of human learning, entertainment, social and business activity. That is a huge potential for providing various mobile business services and related opportunities, resulting in use for all kinds of formal/informal learning needs, driving unprecedented growth and ICT development in all sectors including digital media, eHealth, wireless technology and financial services, with strong emphasis on developing and empowering pure mobile sectors such as; cloud computing, mobile apps economy, Near Field Communication technology (NFC), Augmented Reality (AR), wearables, etc. That unprecedented potential of mobile technologies for learning should be furthermore explored and ventured in our learning technologies quest.